This year, as the de facto education sort-of coordinator guy, it was my job to call up a handful of artists and ask them how they’d feel about us tossing them in front of several hundred rambunctious school kids and telling them to be entertaining. And, as with every year we did find a brave handful willing – and even excited – to go along with it. So on Monday, Tuesday and Wednesday the vans rolled out delivering various combinations of Diane Tribitt, Dave Stamey, Janice Gilbertson, Mike Beck, Dave Bourne, Jerry Brooks, Florida poet Doyle Rigdon and Louisiana zydeco masters Geno Delafose and French Rockin’ Boogie to serve up some kid-sized cowboy poetry and music around Elko, Wells, Carlin and even Eureka. Twice on Wednesday, for the Cowkids Stampede, we packed 900 local kids into the Convention Center auditorium to see Riders In The Sky. 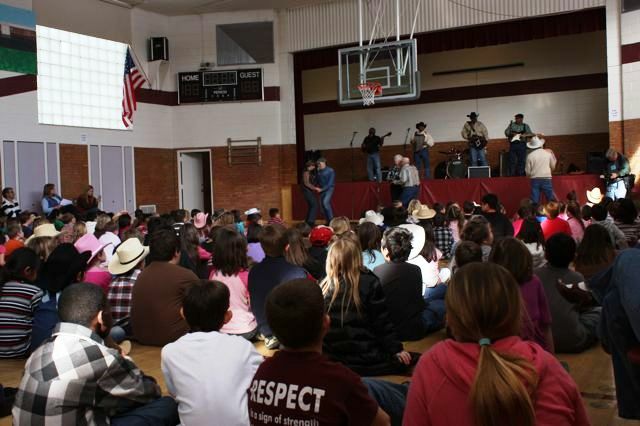 And today Corb Lund performed and talked music with the band and choral students at Elko High School. On Tuesday I got a break from intern duty and snuck over to Elko Grammar School #2 to check out some of the fun. I pulled up, parked, followed the sounds of accordion and rubboard into the gym and caught Geno and the guys rockin’, and our Zydeco Dance Workshop instructors boogyin’, before a bunch of grade-schoolers, seated cross-legged on the floor. 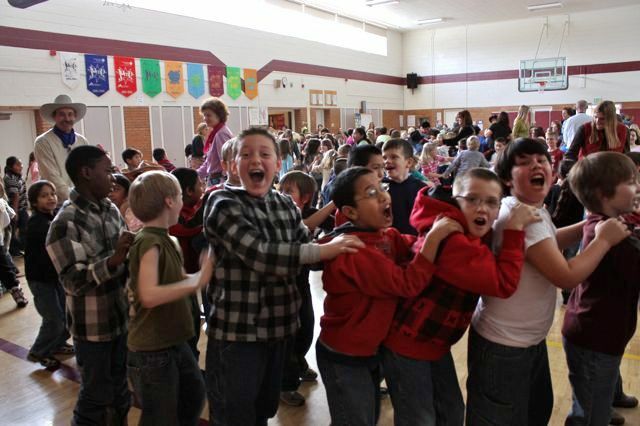 With that, upper-octave cheers filled the room, and the gymful of kids made that simplified two-step last almost all the way through “Move It On Over” before the whole room erupted into an all-out freestyle dance-party. During the next few songs the chaos included conga lines, spinning kid circles, a mohawked would-be breakdancer, and just about every student – and more than a few teachers – flailing their limbs about, running around, pitching their cowboy hats in the air and expending their post-lunch sugar high to the lively sounds of zydeco right here in Elko. Overall, I thought it was an appropriate answer to a fair question. Seeing all this, I realized I still remember the assemblies I saw as a kid, and these kids probably will remember this one for a long time. 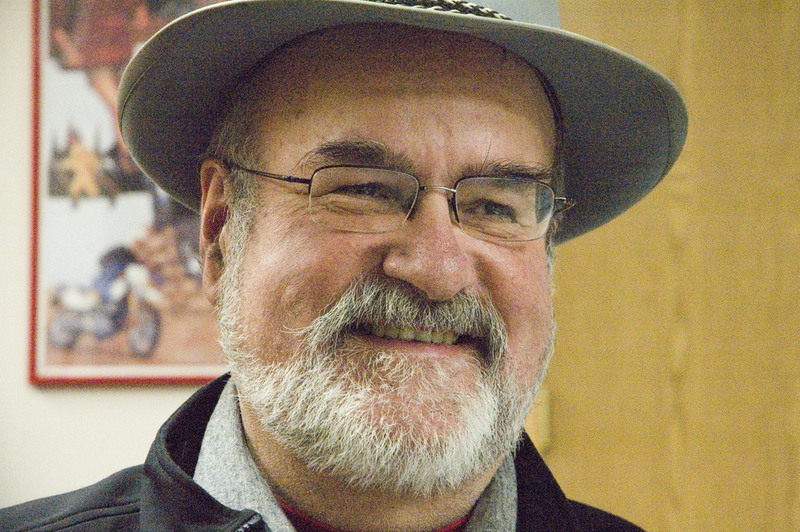 It’s an important side of the National Cowboy Poetry Gathering, and one most folks never see. I’m glad that on Tuesday afternoon, thanks to my job, I got to. Every year we send a fair share of merchandise, workshop supplies and other items over to our outpost at the Elko Convention Center, but this may be the first time we've shipped livestock. Well, OK, she isn't "live," but she is a full-size genuine Cracker Cow, and she came to us all the way from Florida. A beautiful artifact in our featured exhibit, Florida Cattle Ranching: Five Centuries of Tradition -- produced by the Florida Folklife Program, Florida Department of State, and Florida Cultural Resources -- there just wasn't a good place for her in the Wiegand Gallery, so we put her in the cozy Fireplace Nook... right next to the leather furniture. Although we'll miss her staring at us from across the room and startling all who enter the bar, we think she'll enjoy her new job greeting guests at the Convention Center. For the second year we are inviting folks at the Elko Gathering to make a CD with us of memorable cowboy songs. You too can be part of an OK Choral singing along with Liz Masterson, R.W. Hampton, Dave Bourne, Andy Willkinson and Andy Hedges. We will record this Thursday session in the G3 Theater then go back to our cave and make the CD so we can deliver them to you on Saturday so you can sing-along on your long drive back home. So that's the idea. Behind the scenes I've been collecting songs from these wonderful performers. They all have to be original songs or public domain songs so we don't get balled up in rights issues. Also, we can't tax the audience too much with unfamiliar and complex songs. Next step is to make a slide show of the words to the songs which will be projected on a screen during the singing so we can all sound like we did this on purpose. I believe there are still tickets available if you've always had that secret wish to be cowboy singing star. We are all getting very excited to see all of you in Elko next week. 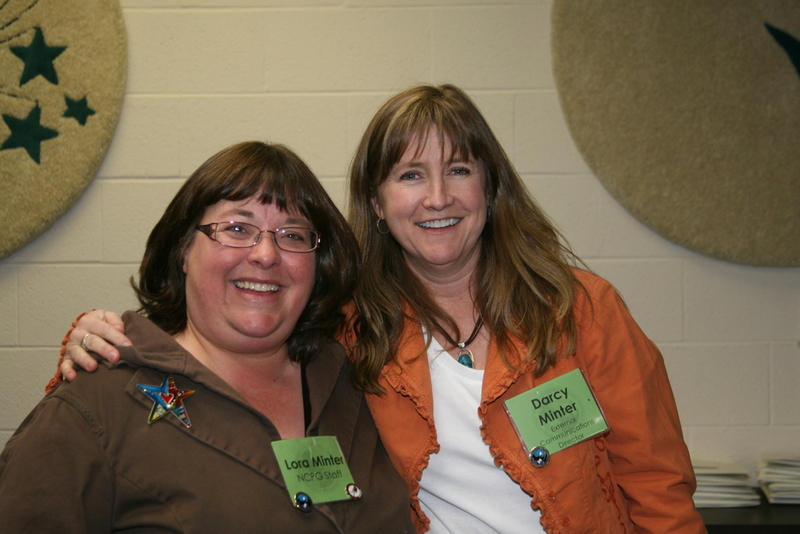 As the Artistic Director for the Western Folklife Center, I have the pleasure of working with Programs Coordinator Tamara Kubacki on the National Cowboy Poetry Gathering. One of our big jobs of the year involves retreating to the penthouse of the Western Folklife Center (with lots of M & Ms) to create the master schedule for the Gathering. We remain forever grateful to the person who invented Post-its as we embarked on creating the schedule for the National Cowboy Poetry Gathering this Fall. 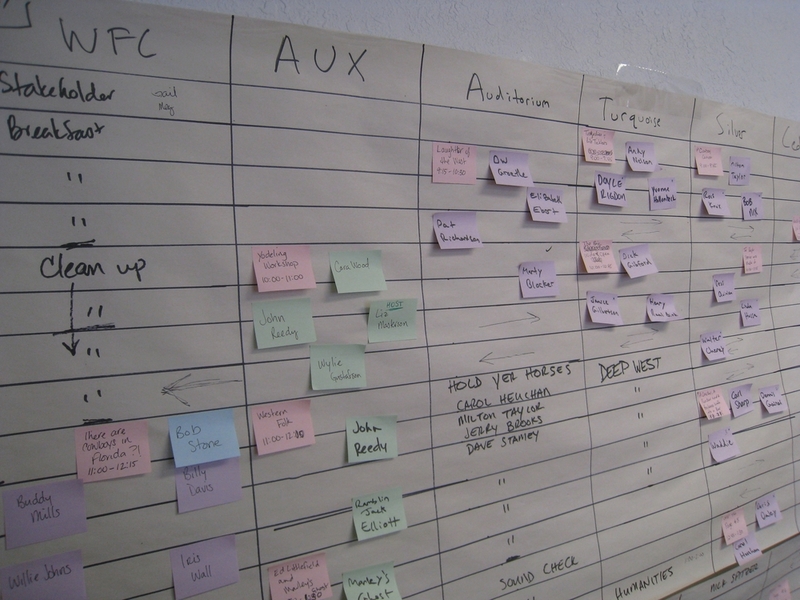 We have been fine tuning our process for scheduling artists and sessions over the 26 years of the Gathering and this highly sophisticated approach seems to work the best for us so far. Our friends at the Northwest Folklife Festival turned us on to this method – their schedule grids cover multiple walls of their offices - and Tamara has come up with a color-coding system that is truly brilliant. Those Post-its get moved around a fair amount before all is said and done, but in the end we hope that everyone is satisfied. We find that in the process of doing this that we get more and more excited about seeing what is on paper come to fruition. To see the final version of the schedule (which is truly never final until the Gathering happens) visit our website. Or, better yet, just make your way to Elko and experience it in person. We're looking forward to the poetry, the stories, the music, the dancing, the workshops, and good company beginning this Saturday! The staff of the Western Folklife Center is hard at work preparing for the big event. After 25 cowboy poetry gatherings, you would think we would have this down to a science. Unfortunately, we don't. It's a moving target. But it's never dull and we thought you might enjoy reading about what happens behind the scenes leading up to the Gathering, and during the week of the event. The Western Folklife Center staff will be sharing our experiences, our excitement and possibly our nervous breakdowns with you as we get closer to January 23rd. During the week of the Gathering, we hope to be joined by other bloggers who will be sharing their thoughts and impressions about performances that touched them and those that didn't, and about the interstitial moments that are sometimes the most meaningful and memorable for Gathering fans and friends. Please join us on our journey to the 26th National Cowboy Poetry Gathering, January 23-30 in Elko, Nevada.